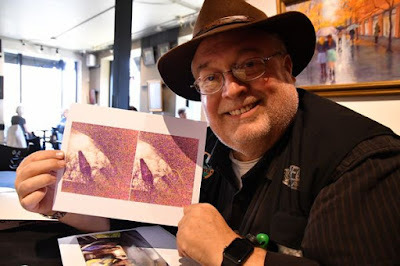 Michael Hall of Edmonds shows off the photos he took in January 2012 of a UFO over his home in Edmonds. Michael Hall grew up in the community, opened his law practice here in 1988 and served a stint on the Edmonds City Council. His mom, Laura Hall, served as Edmonds mayor between 1992 and 1995. Semi-retired now, Hall still practices law, still in Edmonds. But today other interests are taking center stage. And these extend beyond the borders of Edmonds, and beyond even the known universe. Hall is referring to a December 2017 front-page expose in the New York Times documenting the long-running efforts of the Defense Department’s multi-million dollar program to study, investigate and document UFO sightings and reports. According to Hall, this knowledge has been there for decades, but has been kept under wraps and only recently is coming to the fore. It got personal for Hall on a clear chilly January evening in 2012. Using several photo-enhancing apps, Hall zeroed in on the dot and what emerged was nothing short of amazing. 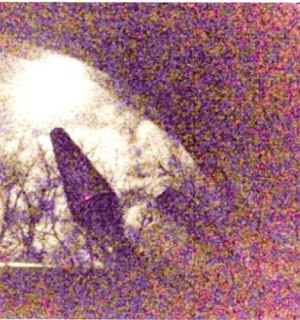 One of the enhanced images taken on January 10, 2012 by Michael Hall showing a cone-shaped UFO in the skies over Edmonds. And the deeper he got, the stranger things became. All iPhones keep a photo stream folder, where photos are stored in sequence based on the time they were taken. Examining the photo stream folder in his phone, Hall was amazed to discover that his moon photos were out of sequence. Specifically, according the file metadata, they were taken not at 9:30 p.m. when he actually took them, but 17 hours earlier, shortly after 3 a.m. that morning, when the moon was in an entirely different position in the sky. Following the trail, he sent the photos to Bruce Maccabee of the Mutual UFO Network (MUFON), for further analysis. MUFON has access to sophisticated analytic tools that can determine a wide array of information from an image, including the exact coordinates, altitude and direction. The results only deepened the mystery. According to Hall, Maccabee found that the photo appears to have been taken from inside a vehicle that was hovering approximately 40 feet above his backyard, showing the image of a second vehicle as seen through a window of the first. So how did these images get on Hall’s iPhone? With increasing reports of similar incidents coming in from around the globe, and the disclosure by the U.S. government of the existence of these phenomena, “the whole question of whether these exist is fast becoming moot,” says Hall. Hall invites anyone interested in learning more or becoming part of this adventure to drop in at any weekly UFOiTeam meeting (meetings are held Wednesday evenings 6-8 p.m. at the Lynnwood Denny’s, 4109 196th St. S.W. ), visit the UFOiTeam website or Facebook page or contact him directly by phone at 425-245-4661 or email at michaelhall3200@gmail.com. UFO sightings should be reported to the National UFO Reporting Center, 206-722-3000. Visitors to their website can also view data on recent sightings and reports.